Bloomberg News has called Hammer "the woman responsible for many of the nation's most permissive gun laws." She's credited (or blamed) for the passage of concealed-carry legislation, the controversial "stand your ground" self-defense law and the so-called "Docs vs. Glocks" law, which seeks to limit physicians from asking patients about gun ownership. 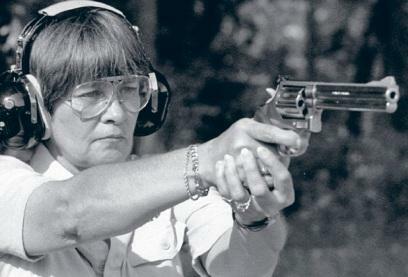 Along with firearms-related issues, Hammer helped secure funding for the McKay scholarships for children with disabilities --- such as her grandson --- and for speed-limit signs outside private schools like the one he attended. She has lobbied to allow dyslexic children to use talking computers during standardized tests. Q: It's said you're in a class by yourself at getting your bills passed --- what's the secret of your success? HAMMER: First of all, do you really expect me to give up trade secrets? Being successful involves believing in what you're doing, because if you don't believe in it, you're not going to care to the depths of which you need to care to get it done. You have to have focus. You have to do your research. You need to have your facts, and you have to believe in what you're doing. People who don't believe in what they're doing rarely give it the dedication an issue deserves. I'm not a hired gun. I am privileged to be paid to do a job that I love doing. And I am successful because I care, because the people with whom I work know that I care. They know that I'm going to tell them the truth, even if it hurts me, and that I'm not going to quit. So it's from that backdrop that I approach every issue. And if it's important enough to start, it's important enough to finish. Q: How did you come to be so passionate about gun rights? HAMMER: Well, I grew up shooting. My grandfather taught me to shoot when I was 6 years old. And I went hunting after school. We were a poor family, and we engaged in subsistence hunting. And that's where my love of guns came from. I guess it's more a love of my right to have and use a gun than it is my love of guns. Sometimes those two get intermingled and mixed up. And when I got married, I married a man that loved to hunt and shoot, and we shot competitively. That was a part of our family recreational activities, and when our children came along, they were involved in it. The '68 Gun Control Act angered me beyond belief because our government, that is supposed to protect us and our rights, decided to engage in some political eyewash. They wanted to pass a piece of legislation to make themselves feel good because we had had some tragic assassinations (John F. Kennedy, Martin Luther King, Jr. and Bobby Kennedy) that had nothing to do with guns, but with people. I started working to try to stop the '68 Gun Control Act. I believed they were serious about passing it. I couldn't get other shooters, other hunters, other sportsmen, heavily engaged because they just didn't believe it would happen. And it did. And that started waking people up to the arrogance of government to trample the rights of law-abiding citizens who had done nothing wrong, to make themselves feel like they were doing something. From that point on, I never really got out of doing everything I could to protect those rights to see to it that that sort of thing didn't happen again. You win some, you lose some. I love to win, and I do not like to lose --- particularly when there's so much on the line. Q: You were the first woman president of the NRA. What was it like being a woman lobbying for a major issue that was predominantly associated with men? HAMMER: When I would stand in front of a committee, testifying on the gun issue, I found that a lot of legislators --- probably 99 percent of them back then were men --- thought they knew more about guns than I did. Because they were men, I mean, and men naturally know more about guns than women. And I would find in committee that I would be asked questions --- I was being tested. I was being asked questions about differences in guns and differences in ammo that were everyday, around-the-potbellied-stove-at-the-general-store kind of questions that had no bearing at all on the legislation. Well, it didn't take 'em long to figure out that I knew my stuff and they better quit asking those questions, because when I gave the right answers, they looked bad. So you make your own place in the world in which you live and work. I've had, I cannot tell you through the years, how many legislators --- men --- have called me for private conversations about which gun they needed to buy, and where was the best place to get it, and where can I find the best price? Q: While you were leading the NRA, you took in your daughter, who was terminally ill, and your grandchildren. How did you balance your family with your leadership responsibilities? HAMMER: You just do it. I mean, some things you just do. You don't think about it. I raised three daughters and then two grandchildren. My youngest daughter was diagnosed with a terminal, inoperable brain tumor, just weeks after I was elected president of the NRA. That was a personally devastating thing. And so here I am in a new position with the nation's spotlight on me and a pain that is burning a hole. I've always believed that the good Lord's not going to give you any more than you can handle. There were times when I wondered if He was paying attention, but I always managed to get it done. Two years after she was diagnosed, her husband walked out. He told me, "I didn't sign up for this." And he walked out on her and two little children. When Sally was diagnosed, Kayla wasn't even a year old. So I moved her and the kids in with me. The kids and I took care of her and each other, and I did my job, and we got through it. And now those kids are grown. Eric is 21 years old today, and last month Kayla turned 18. So it's been a long time, but they've kept me young. They've kept me active. And we've managed to be successful as a family and in the workplace. Q: Eric is also the basis for your lobbying for children with disabilities. HAMMER: Eric has severe dyslexia. When he got to be about five, when we put him in pre-school, we began to realize that something was wrong. We weren't sure. And when he started kindergarten, he failed kindergarten. So they put him in K-1, and they called us in and said he was going to fail again, and they didn't know what to do with him. We had him tested and found that he had severe dyslexia. He just couldn't read the way they were teaching. And so I spent a lot of time advocating for children with disabilities because the parents needed somebody to advocate for their children, and they certainly didn't have the money to hire a big-time lobbyist. So we got a bunch of us, you know, working to do what we could to help kids. And any time that there are issues dealing with children with disabilities and their educational issues, you're going to find me in the middle of it --- because I saw what getting the right kind of education did for my grandson. His kindergarten teacher, his K-1 teacher, told me that he was a throwaway, that he would never learn. When that boy gave the valedictorian speech at his high school graduation, there wasn't a dry eye in the room. He's now going to be a junior in college and he has a 3.5 grade-point average. This is a kid who's a throwaway? Because some teachers don't want to teach? They don't want to think outside the box? They don't want to have a kid that doesn't fit in the same little cookie-cutter hole? These kids need somebody to advocate for 'em, and I'm going to be there as often as I can. And I've worked with a lot of legislators through the years, getting things done that probably wouldn't have happened if there weren't a lot of us who cared about the issue. I will never forget that awful December day. My daughter left to school and I turned on the TV. I stumbled upon something that read “School Shooting.” All I could think was that my little princess was at her school and that this could happen anywhere. As it was getting time to pick her up, I rushed a little more and could not wait to hear her voice and see her smile. As soon as I saw her, I felt an immense sense of relief and peace. Tears kept on coming down my face. It's been a busy week in Washington, D.C.
As lawmakers react to the Boston Marathon bombings, parts of the Capitol had to be evacuated after suspicious letters addressed to U.S. Senator Roger Wicker and President Barack Obama were intercepted at mail screening facilities. While dealing with that scare, members of Congress are getting their first look at a proposal for immigration reform put forth by the so-called "Gang of Eight" Senators including Florida's freshman Republican Marco Rubio.